Fernando Llorente (£6.3m) offers FPL managers a prime short-term differential as, once again, he seeks to exploit home comforts for the visit of West Ham United on Boxing Day. 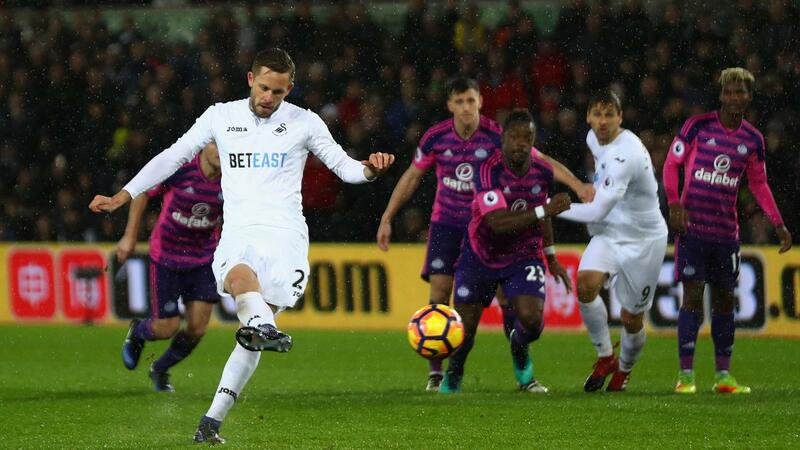 After netting just once in the opening 12 rounds of fixtures, the Swansea City striker has bagged a brace in each of his last two appearances at the Liberty Stadium. Emerging from the bench against Crystal Palace in Gameweek 13, Llorente grabbed two goals and an assist to spark a 5-4 comeback victory, before scoring twice in a 3-0 win over Sunderland in the Swans’ following home fixture. When assessed against his team-mates over the last five Premier League matches, Llorente is second only to Gylfi Sigurdsson (£7.5m) for total attempts, by 12 to 17. But he leads the Iceland international by 12 shots to four inside the penalty area and also betters him for efforts on target (six to five). There is no question that Llorente has upped his goal threat in recent matches. The forward’s average shots per match have improved from 1.8 to 2.4, along with his efforts in the penalty area (from 1.7 to 2.4) and attempts on target (from 0.8 to 1.2). Indeed, Llorente fares very well when compared with other FPL forwards from Gameweek 13 onwards. The Spaniard is ranked joint-top with West Bromwich Albion’s Salomon Rondon (£6.6m) for efforts in the box, with 12 apiece, and is second only to Tottenham Hotspur’s Harry Kane (£11.2m) for shots on target (six to eight). Up next, Llorente welcomes a travel-sick Hammers defence with a single clean sheet on the road. Indeed, away from home, Slaven Bilic’s side are ranked second-bottom for big chances conceded (21) and fourth-worst for conceding penalty area attempts (86). With a visit from AFC Bournemouth and a trip to Crystal Palace over the next three rounds of fixtures, the 5.2%-owned Llorente has the chance to emerge as a short-term festive punt before the schedule turns against Swansea City from Gameweek 21 onwards.